On March 26, 1980, the new Cedar Rapids-West Rotary Club was officially chartered by Rotary International. To celebrate the occasion, a "Charter Night" was held in the ballroom of the Stouffer's Five Season Hotel on May 14, 1980. Members of the Rotary club and their spouses attended, along with District Governor Bill Edward who initiated the 50th club into District 5970. After dinner, the 22 charter members of the new club were inducted into Rotary and the Cedar Rapids-West Rotary Club was officially born. The strength of any organization is its members and three of Cedar Rapids West Rotary's members certainly demonstrate that strength by becoming District Governors. Jerry Springston served in 1992-1993, Don Melichar served in 2002-2003 and Dr. Bill Jacobson served as District 5970 Governor for 2008-2009. We are looking for photos and history that current or past members have about the club. Please contact Chris Lindell. 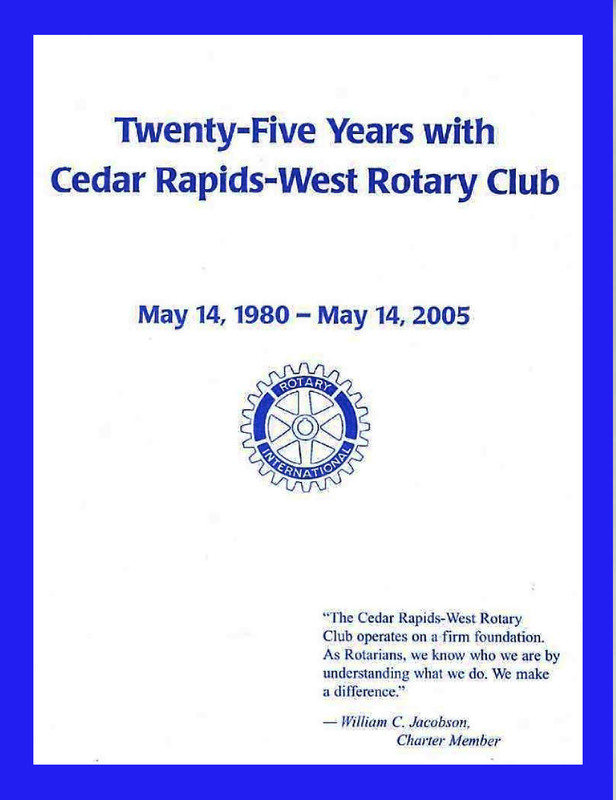 For the complete 1980 to 2005 Cedar Rapids West Rotary Club history, download the PDF below. The book was prepared by Kathy Kaiser (Chair), George Branstetter, Lyle Hanson, Marilyn Lefebure, Kay Graber (Editor), Don Melichar, Bill Jacobson, Rhonda McCombs, Wayne Josifek (Gen. Chairman), Gary O'Brien and Kim Kudej.